Amaou Oatmeal Black is secretly a bomb contained within a bottle. I had to get that out of the way first because when I opened this straight out of the fridge, it exploded and went everywhere. Over the walls. Over the kids. Over the wife. Everywhere except for the glass. Luckily, I had two bottles and was well prepared yet the second also exploded. Luckily, I managed to save some but not before a giant head had formed. 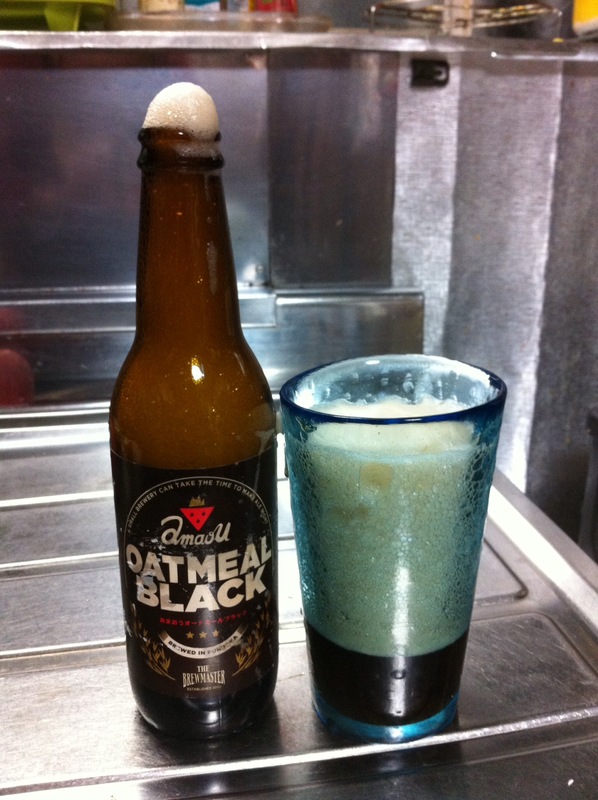 Amaou Oatmeal Black is a stout that has oatmeal added during the brewing process. This beer exploded out of the bottle. It went everywhere besides the glass. Perhaps our bottle of Amaou Oatmeal Black was iffy or maybe the glass was wrong but this beer just exploded out of the bottle. Usain Bolt would have been proud with the start Amaou Oatmeal Black had. Once it had settled down, and my kids had graduated from university (it really did take that long to settle), the body was a pitch black colour with a solid off-white head. The malty aroma paired with a nutty edge was well rounded but the strong scent of alcohol was noticeable. The first taste you’ll notice drinking Amaou Oatmeal Black is the alcohol. It really is such a potent taste to the beer that it is a little unnerving. The last thing I want to taste when drinking beer is the alcohol, leave that to the cheap nasty beers. Besides that, Amaou Oatmeal Black is a thick bodied beer that has a sweetness to it that it also a too strong for my liking. Amaou Oatmeal Black is akin to someone dipping liquorice in alcohol and soaking it for a while. Really can’t recommend this. After hearing about Rob’s disaster, I decided to open this in the sink. It didn’t explode, but it opened with a loud bang – louder than a champagne bottle- and then proceeded to spew forth its contents into the sink. What remained tasted like a curious mix of a stout and a saison, and not a hearty bowl of porridge as I was led to believe. Avoid. Amaou Oatmeal Black can be bought on The Brewmaster homepage here. One bottle would be acceptable, but three bottles? I could perhaps understand two of my bottles being from the same batch but a third from a different store at a different time? That’s either someone screwed up with the carbonation levels or someone bottled too much yeast.